After the adventure the Terrible Warriors talk and lament the high and low points of the adventure. Scotty, the new player talks about his first roleplaying experience… and what little he learned from it, The Fist of Justice talks about playing a rambling genius, Birdman talks about future shows and Snowball bemoans his fate as Captain America. The crew rambles on late into the morning as the dice lie still waiting for the next adventure. In the epic conclusion, The Avengers face their mightiest opponent ever! Possessing all of their strengths this enemy stands poised to take down the team as they try desperately to break through his seemingly impenetrable defense. The fight is on to save the Shield helicarrier, its personnel and possibly the world from this threat. Will they save the day? Will they fail during the moment of truth; will they end up blowing up the helicarrier by accident? Click to find out. Having learned the true identity of the creatures inhabiting the helicarrier the Terrible Warriors embark on a race to stop the “Synchronization” going on deep in facility to the old Tesseract laboratories to find out what’s being done and what is the invader’s master plan. They must then try and notify the outside world and determine what happened to the real Shield agents aboard the helicarrier. Meanwhile the “Synchronization” continues and a new enemy is revealed. After receiving a strange message from an unknown “NF” the Avengers are set on trying to uncover what’s going on in the Helicarrier, attempting to confront Fury about the strange events going on and trying to put an explanation to the strange behaviours of the crewmembers. As they try to find the truth they uncover a secret aboard the vessel that turns every turn around a corner into a potential battle for survival. 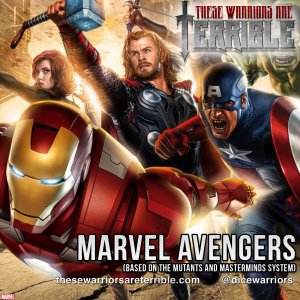 On this new episode of These Warriors are Terrible Birdman, Snowball, “The Fist of Justice” and some guy named Scotty take on a new adventure in the Avengers universe using the Mutants and Masterminds system shortly after the event of summer hit film The Avengers. The group is called into action by Nick Fury with the news that The Hulk is rampaging across the Canadian Rockies on his way to a civilized area. As the Shield Helicarrier makes its way to stop Banner the group notice some odd behavior among the crew.